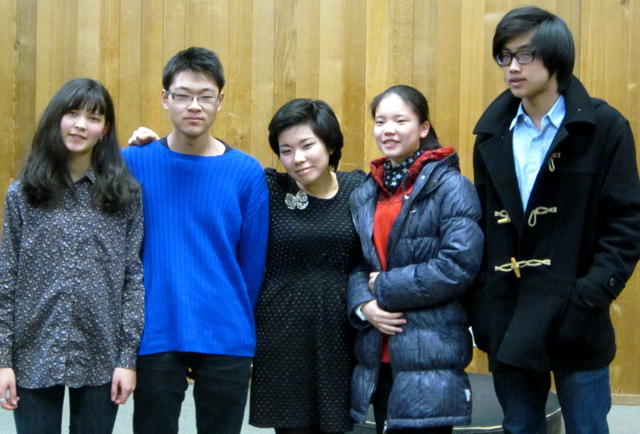 The Tuesday, Nov. 8th afternoon concert at Stephens Recital Hall was limited to just a select few. 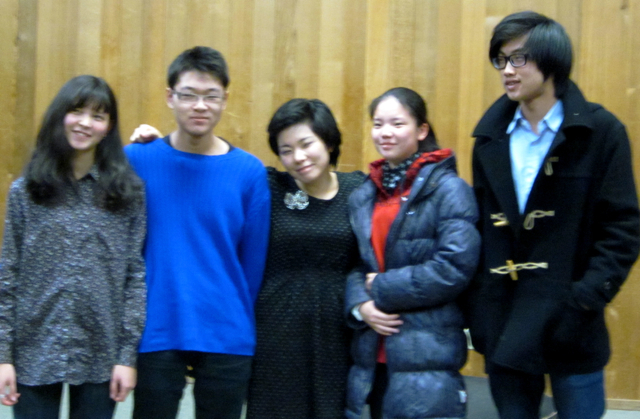 Among those in attendance were student composers, poets, and musicians, along with a few teachers. What they were about to hear was a New Music composition by Peter Askim, Idyllwild Arts’ award-winning music director and composer-in-residence. Not only were they going to hear a brand-new piece, but also the viola player was a winner. 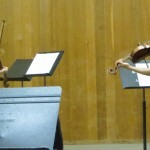 “This viola piece called, ‘Inner Voices,’ was written for the Primrose International Viola Competition in Austin last year, but the winner is here tonight to play it for us,” said Peter Askim, and then introduced Ayane Kozasa, a senior music student at Curtis Institute of Music in Philadelphia. Peter handed out a few scores of “Inner Voices” for those who wanted to follow along, as Ms. Kozasa walked to the front of the room. She was a pretty woman in a black shift dress, and boots that matched the snow outside. Her hair was cut short, perhaps so that it wouldn’t interfere with her instrument. Looking around, I learned quickly the best way to listen to New Music compositions, was to close your eyes. To my right, Peter had his eyes closed and was leaning forward slightly. To my left, Andrew Leeson, an Creative Writing instructor, also closed his eyes and leaned back in his chair. 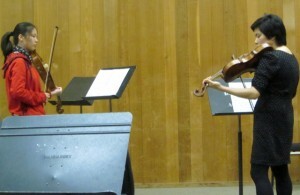 Across the room, Idyllwild Arts Headmaster Brian Cohen (who also plays the viola) had his eyes closed. 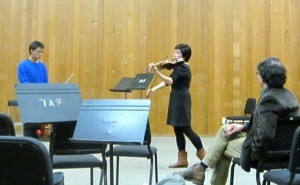 Ms. Kozasa shows Alex how to dance while playing his piece as Brian Cohen looks on. I wasn’t sure why these guys were closing their eyes when there was a pretty coed onstage, but I guessed it was “all about the music” at this point. From a past experience of listening to a New Music Concert at the Los Angeles Philharmonic last year, I knew that it wasn’t going to be like any standard music. It’s as if the composers crumpled it up and threw it out the window. 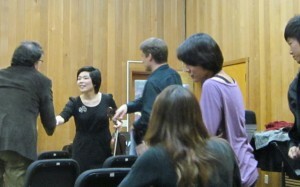 When the conductor started the New Music Concert at the LA Phil, I thought all of the musicians were still warming up. The piece had an unsettled, frenetic feeling about it. “When are they going to start playing?” I asked the student next to me in the balcony. “Shh, they’re playing,” was my answer. Now, sitting in Stephens Recital Hall listening to Peter’s “Inner Voices,” I knew to expect the unexpected. I breathed in slowly, resisting the urge to close my eyes and decided to focus on the young woman’s viola and bow. What came out of her instrument was frenetic, and intense. Like someone running through the snow, but at a very fast pace. Maybe the person was running from the police? Who knows? But he was definitely running for his life. Then I realized that it wasn’t likely an urban setting, but perhaps in Idyllwild. I imagined a person running through the forest. Since there aren’t any bears in these parts, perhaps the person was running from himself? Then, after the intense part ended, the mood changed, and everything slowed down dramatically. Again, I thought of nature, and how everything seems calm after a rainstorm. Meanwhile, Ms. Kozasa was putting on a nice performance for the audience who still had their eyes open. She moved across the stage, often times arching her bow as if it were a spear. Then she’d play the queer high notes with such delicacy that her bow barely touched the strings. During “Inner Voices,” there were many long pauses, in which I was tempted to clap before it was over. Yet, I resisted, and succommed to the tension of the piece, which ended with more of a light “pop” than a razor-sharp dramatic ending. That was rather nice. 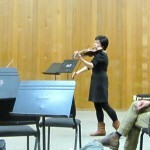 “That’s amazing world-class playing,” Peter said, as he stood, clapping for Ms. Kozasa. “Peter is the master of negative space,” Andrew exclaimed. When Peter heard that comment repeated later on, he laughed. Ms. Kozasa said that it wasn’t a difficult piece to play, once she broke it down into sections. 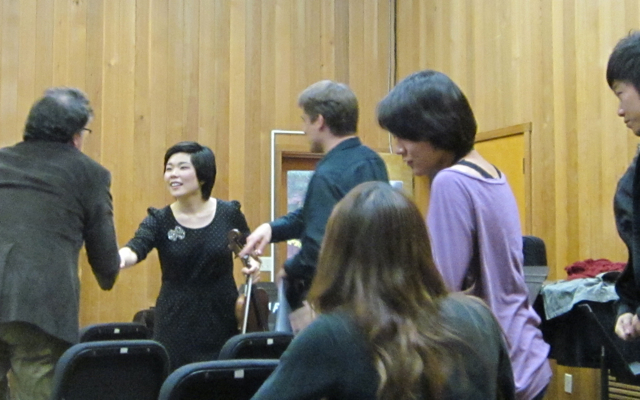 Peter asked her to explain to the audience how she would approach playing a new piece such as this one. Peter said that oftentimes, the students think about the fingerings and trying to get the rhythm right, but they have a hard time finding out the meaning of the piece. 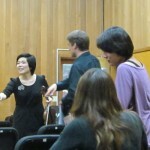 Ms. Kozasa said that she tries to find out what the composer is trying to say within the fingerings of the piece. Whenever possible, she also researches other music from the same composer to help with the meaning. Afterward, Peter said that he finished “Inner Voices” about this time last year, but it had nothing to do with nature or the weather in Idyllwild. So much for my interpretation of a man running through the snow. For the next hour, Ms. Kozasa held a Master Class in which sh worked with four viola players, including Howard, Alex, Kathy and Syriah. 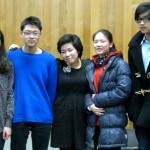 Each played a short piece for her, in which she gave input and suggestions. 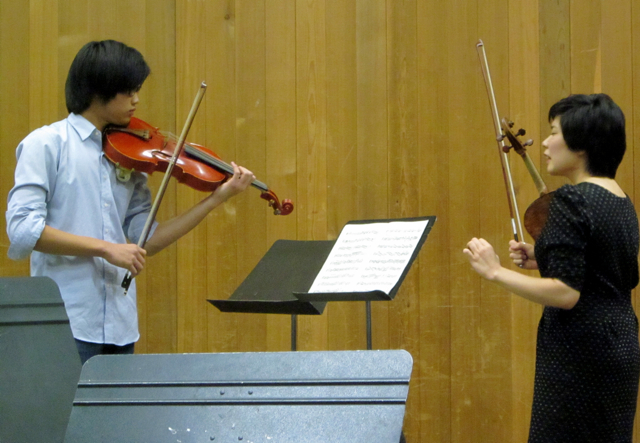 More often than not, Ms. Kozasa suggested the students become more physical and aggressive in their performances. For example, when Alex played a slow, Bach piece, Ms. Kozasa stated that it was a dance, and suggested that Alex take a few dance steps. What?! Dance while he was playing? I tried to imagine what was going through that young man’s head! And then she played the same song, but exaggerated the steps to an unknown dance as she moved across the stage. Alex, likely eager to please, played the piece again, and moved as best he could to the ancient dance. After all of the students had played, Peter and Ms. Kozasa stuck around at Stephens to record the piece. He said to look for it soon on iTunes. 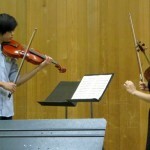 For more information and to see a video of Ms. Kozasa at the June 5th Primrose Competition, visit www.peteraskim.com. This entry was posted on Friday, November 11th, 2011 at 1:28 am and is filed under Idyllwild Arts Academy, Music. You can follow any responses to this entry through the RSS 2.0 feed. Both comments and pings are currently closed.